I am currently jealous of any person currently living in an area where the daily high temperatures are not rising above 70º. Here in southern California…we’re still in the thick of the heat. Today we had a major dip and the high was only 84º! Last week, husband and I were enjoying a late summer vacation around the Teton region in Wyoming and Idaho and although it was certainly cooler…it was still ridiculously hot for this late in September. Wild fires still abound and our days were filled with smoky haze. However the brisk early mornings and waning light left me hungry for fall weather. Casserole weather. I love enchiladas as they tend to include cheese (love), corn tortillas (love) and they beg to be topped with the quintessential Tex-Mex garnish of sliced canned black olives. No, these hybrid enchiladas will not get you more miles to the gallon…but they are a mixture of enchilada preparation styles from both my family and my husband’s family. Woody likes his enchiladas on the spicy-side and I prefer it a bit milder so I tried to maximize the flavor of the sauce while not creating a volcanic sauce that would ruin the fun of my dinner. Truly…I winged it. In its most basic form, enchilada sauce is tomato sauce that has been flavored with chilies, onions and spices. There are plenty of recipes out there to use as a starting point. You’ll also notice from the above photo, that I used a portion of prepared enchilada sauce in making my sauce. I tend to not love the sauces straight from the can, but they can enhance the depth of your sauce and make things a bit more complex. Enchiladas can be made with flour or corn tortillas. I like both, but they are very different, with corn being more authentic. To use corn tortillas and make them malleable, you need to soften each one in a bit of hot vegetable or canola oil first. 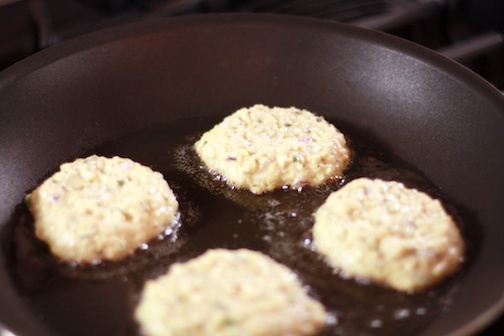 Heat a shallow fry pan that is at least the size of your tortillas with ¼” of oil in the bottom. You are not trying to make crispy tortillas…rather they should soak up a bit of oil which will make them easy to roll without tearing and ripping. 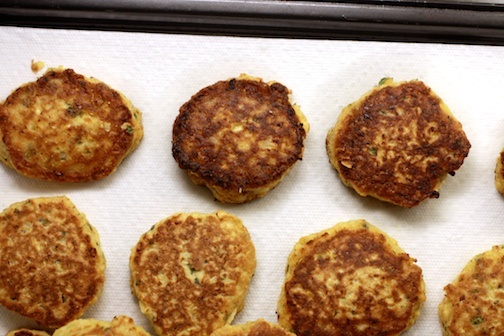 Using tongs, slip each tortilla into the warm oil for no more than 5-15 seconds per side and stack warm on a plate. It’s best to do more than you think you will need so you don’t have to go back and repeat this step. When the oil gets low, just add a bit more and let it heat back up. If the oil is spitting, it is probably too hot. I filled these enchiladas with jack cheese and Ortega green chiles. Cut the cheese into ¼ to 1/3 inch logs and slice the canned whole green chiles into lengthwise slices. 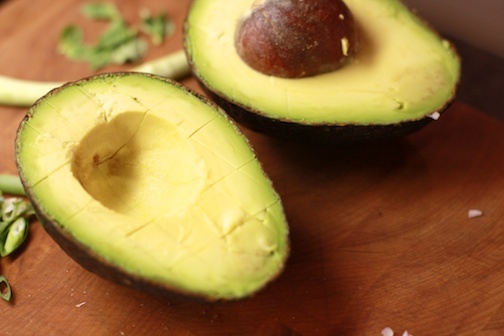 Place one of each onto a tortilla and roll tightly and place the seam side down into a baking dish. Continue until you have filled the pan and squished in as many as possible. While I was building the enchiladas, my sauce was bubbling away on the stove. When the pan is filled, it is time to lade the sauce over the enchiladas. I started the sauce with sautéing a thinly sliced onion which is why it looks a bit chunky and stringy. Smooth sauce over the top, letting it settle into the nooks and crannies. Tope with shredded cheese and (of course) sliced black olives. Now it’s time to bake this delicious pan of cheesy goodness. You can also wrap it with foil and freeze it at this point – I had enough to feed an army…so I froze a whole second pan for sometime in November! Bake at 350º for 20-30 minutes (from frozen it will probably need more like 45-60 minutes – and you can put it directly in a cold oven, and that way you can avoid the risk of your dish breaking from temperature shock as it will heat up with the oven). If it is browning too quickly, cover with a piece of foil. Let it stand for a few minutes once you remove it from the oven and then serve it up with your favorite sides. We went with beans and a little garnish of fresh cilantro and a dollop of sour cream (which didn’t make it into the photo). Side note: I out-spiced myself with this particular dish. In my attempt to satisfy my husband’s need for some heat…I went a bit far with the chiles, cayenne and chile powder. Oops! At least one of us loved it! The sour cream helped me cool down the dish for my pathetic pallet. What are you cooking now that the weather has turned (in most places)? Desserts in the summer should be delightful. Fresh and vibrant. I think you get a little more leeway with summer desserts…it can be an unexpected little something to try…so serious expectations. So I say, run with it. Try something new, be a little different and surprising! Polenta cake fits the bill. 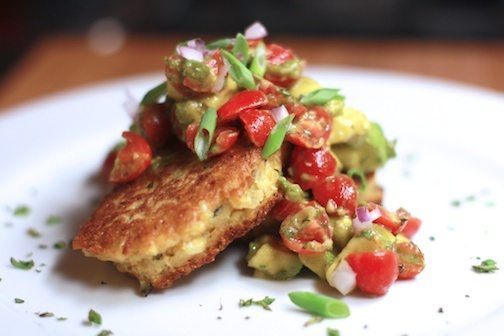 Think of this as somewhere in between corn bread and a citrus cake. Rachael of pizzarossa was our August 2012 Daring Cook hostess and she challenged us to broaden our knowledge of cornmeal! 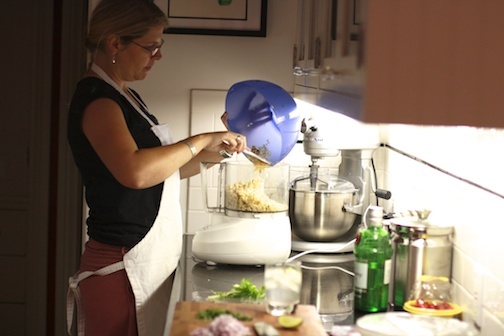 Rachael provided us with some amazing recipes and encouraged us to hunt down other cornmeal recipes that we’d never tried before – opening our eyes to literally 100s of cuisines and 1000s of new-to-us recipes! Original recipe can be found here at from the Bon Appetit website and is also on epicurious! Position rack in center of oven and preheat to 350°F. Butter 9x5x3-inch metal loaf pan. (I used a mini bundt pan and a quarter size loaf pan which seemed to hold all the batter.) Dust pan with flour; tap out excess. Whisk 1 1/4 cups flour, polenta, baking powder, and salt in medium bowl. 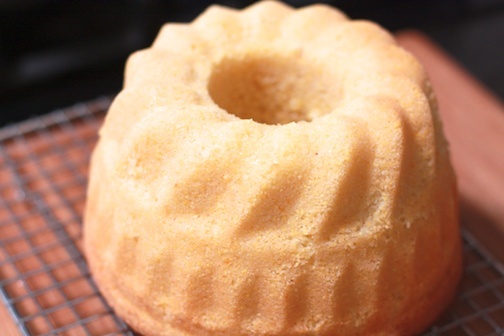 I used Golden Pheasant Polenta and the texture was perfect – coarse enough to notice but not so much that it ruined the texture of the cake batter! 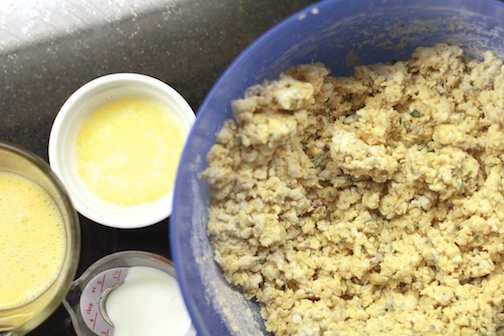 Using electric mixer, beat sugar, butter, and orange peel in large bowl until fluffy, about 2 minutes. Add eggs 1 at a time, beating well after each addition. Beat in vanilla. 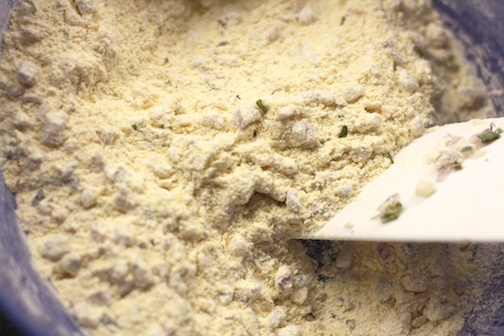 Add flour mixture in 3 additions alternately with yogurt in 2 additions, beating just until blended after each addition. Spread batter evenly in pan.Bake cake until golden and tester inserted into center comes out clean, 50 to 55 minutes (my mini pans took less time…I started them with 35 minutes and tested every few minutes after). In the meantime, prepare the plums and blackberries so they have enough time to macerate. 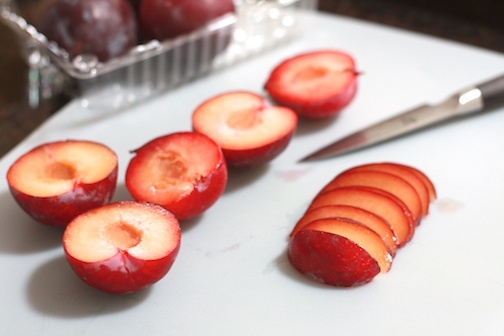 Halve the plums (I used 3) and remove the pit and then slice somewhat thinly. 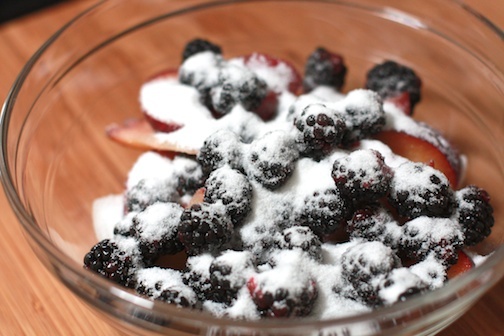 Add in a handful of blackberries and sprinkle with 2-3 tablespoons of sugar. Toss gently and let sit for at least an hour. Transfer to rack; cool in pan 15 minutes. Run knife around cake edges to loosen. Invert cake onto rack, then invert again on rack (top side up). Cool completely. 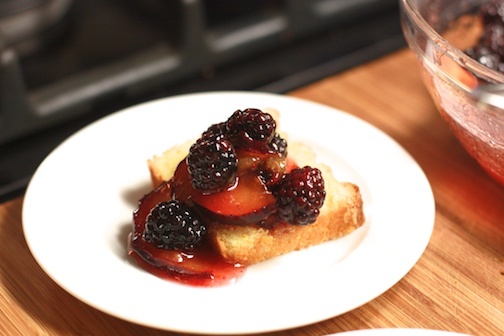 Cut cake crosswise into 1/2-inch-thick slices; serve with sugared plums and blackberries. 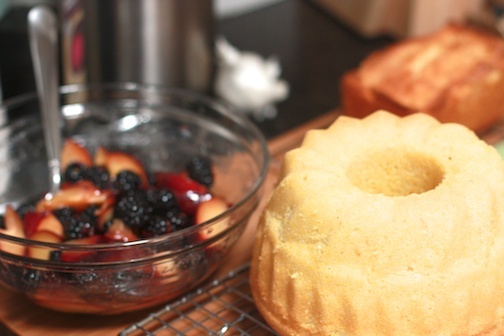 And for a little extra ummmpffff…top with whipped cream or vanilla ice cream. This cake was delicious the next morning, sliced, toasted and spread with just a bit of butter. I may have eaten it for a week straight this way! 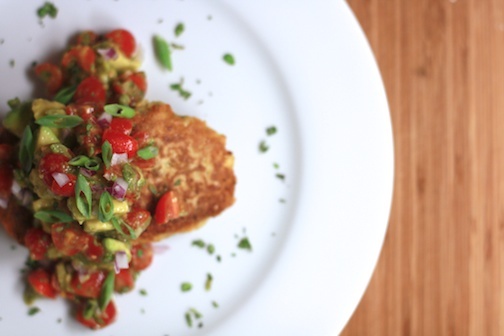 I don’t know about you…but, I measure my summer in corn and tomatoes. Looking through recent photos…I’ve gone a little heavy on the corn as of late. I was flipping through a cookbook at my parents and this recipe for Corn and Parmesan Pesto with Tagliatelle immediately caught my eye! 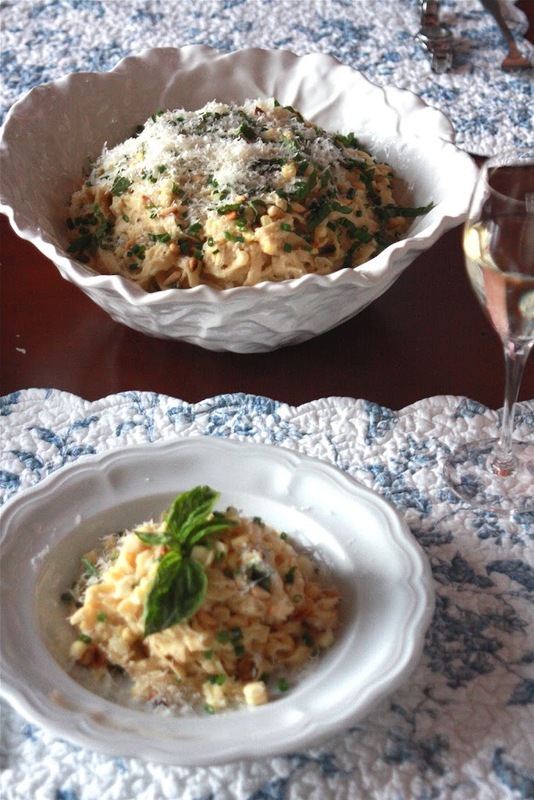 Fresh pasta with a fresh corn pesto topped accented with a little bacon and fresh basil just screamed SUMMER to me! I had to make it and make it, I did. The book is The Farm: rustic recipes for a year of incredible food by Ian Knauer, and after making this dish and drooling over the photos throughout…it is definitely on my cookbook wish-list! He also happens to have a blog as I found out while researching a bit and I have now bookmarked this recipe (dare I try yet another buttermilk panna cotta?) as well as this one for future endeavors. I don’t know why I had not thought of corn pesto before…but it will for sure have a place in my summer repertoire from now on! Hmmm…I wonder what other types of pesto I could make? Mushroom pesto…what about a zucchini and summer squash pesto…? The recipe (courtesy of Ian Knauer) is shown below and includes a few adaptations I made…adding bacon and scallions and using store-bought fresh fettucine pasta. 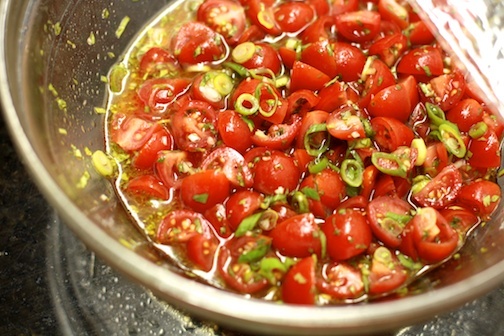 Heat 3 tablespoons of the oil in a large heavy skillet over medium-high heat until it shimmer. Add the corn, onion, garlic, 1¼ teaspoons of salt, and ¾teaspoon pepper and sauté until the corn is just tender but not brown, about 4 minutes. 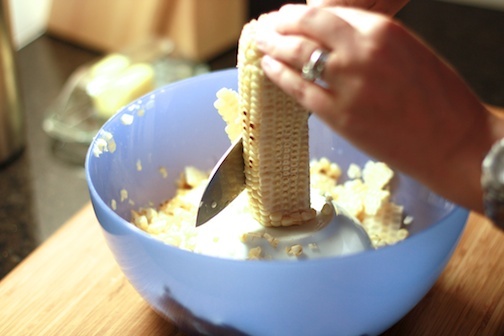 Transfer 1½ cups of the corn kernels to a small bowl. 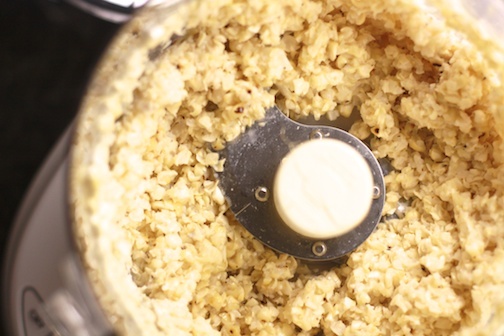 Scrape the remaining corn mixture into a food processor. Add the parmesan and the toasted pine nuts. With the machine running, add the remaining 1/3 cup olive oil and blend until the pesto is almost smooth. Cook the pasta in a large pot of heavily salted boiling water, according to package directions until al dente. Reserve 1½ cups of the pasta-cooking water, then drain the pasta. Return the pasta to the pot. 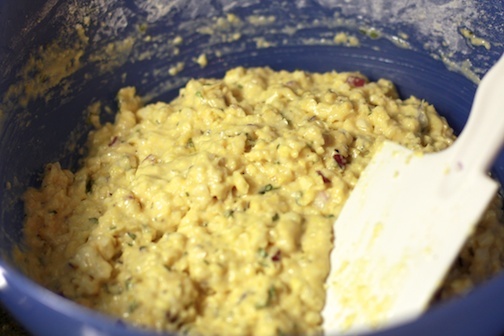 Add the corn pesto, the reserved corn mixture and ½ cup of the basil leaves as well as the crumbled crispy bacon. Toss the pasta over medium heat until warmed through, adding the reserved pasta-cooking water to thin to the desired consistency, 2 to 3 minutes. Season the pasta to taste with salt and pepper. Transfer the pasta to a large shallow bowl. 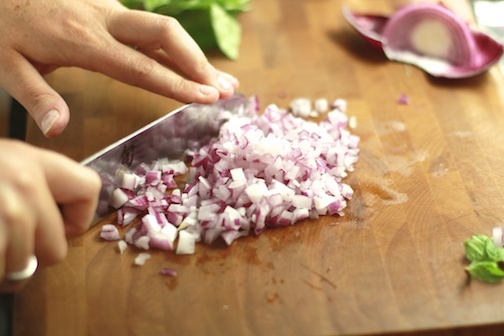 Sprinkle with the remaining ¼ cup basil leaves and the sliced scallions and serve with additional grated parmesan. I doubled the recipe as I was feeding a crowd, and having leftover bacon (what a phenomenom…leftover…bacon…?) from breakfast, I couldn’t resist adding it to the dish. I think the smoky bacon flavor countered the sweetness of the corn, the bite of the onions and the freshness of the basil really nicely. Are you a corn purist? 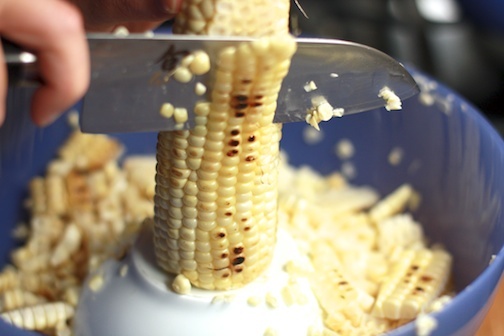 Eating it straight up on the cob with melted butter and salt…or do you prefer your corn as kernels and mixed in and amongst other ingredients?